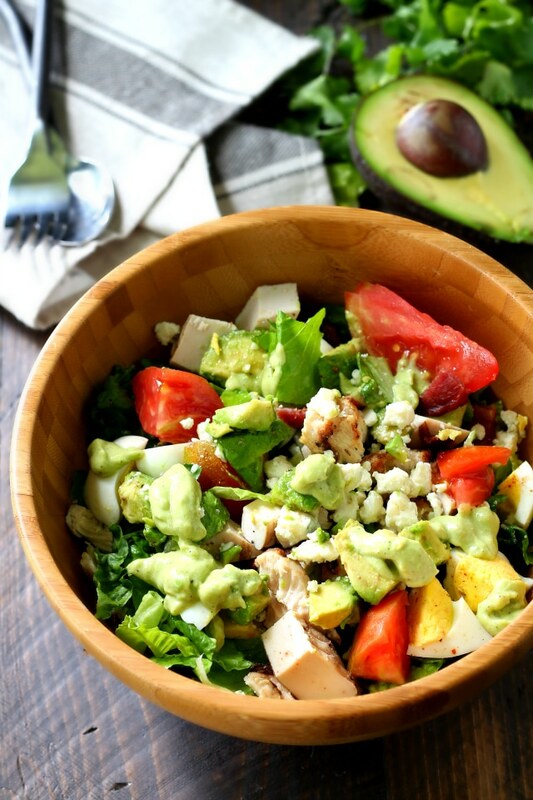 This Healthy Chicken Cobb Salad has all of the goodness you remember from the classic cobb salad, but is made healthier with organic, all-natural, lighter ingredients. I’ve also swapped out the typical dressing and kicked the flavor up a notch by using a creamy avocado dressing. Remember when I said that the Copycat Panera Bread Fuji Apple Chicken Salad was my favorite? I was being totally honest. I’ve been enjoying that salad on repeat for months. 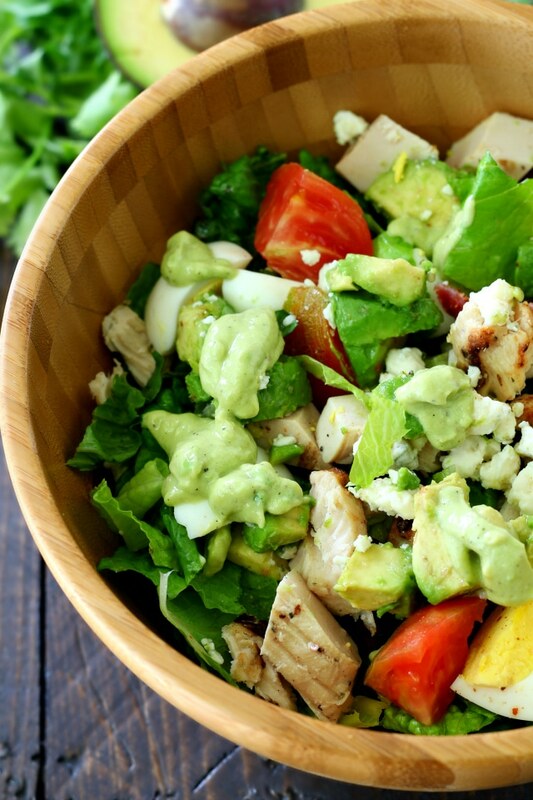 Well, after whipping up this Healthy Chicken Cobb Salad with Avocado Dressing over the weekend, the Fuji Apple Chicken Salad has some stiff competition. There’s a new favorite salad in the house! Robert H. Cobb was a very smart guy. 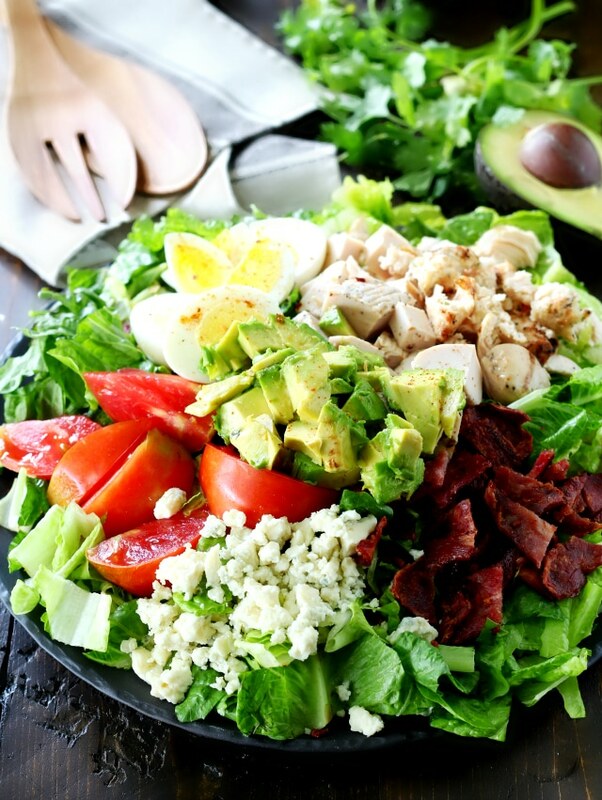 The restaurant owner combined iceberg, romaine, watercress, bacon, blue cheese, tomatoes, hard-boiled eggs, chicken and avocado to create a flavor explosion and dressed the deliciousness with a red wine vinaigrette, to come up with the colorful classic. Nothing against the great Mr. Cobb, but I’m pretty sure this version might just be a step up from the original. Don’t take my word for it, give it a try for yourself. It actually comes together pretty quick. Sizzle the bacon while you’re prepping the veggies and dressing. Also, to make the prep work super easy, buy already boiled eggs and cooked chicken. Both Trader Joe’s and Costco, sell wonderful organic, all-natural, grilled chicken breast. Rotisserie chicken would also be a great quick option. 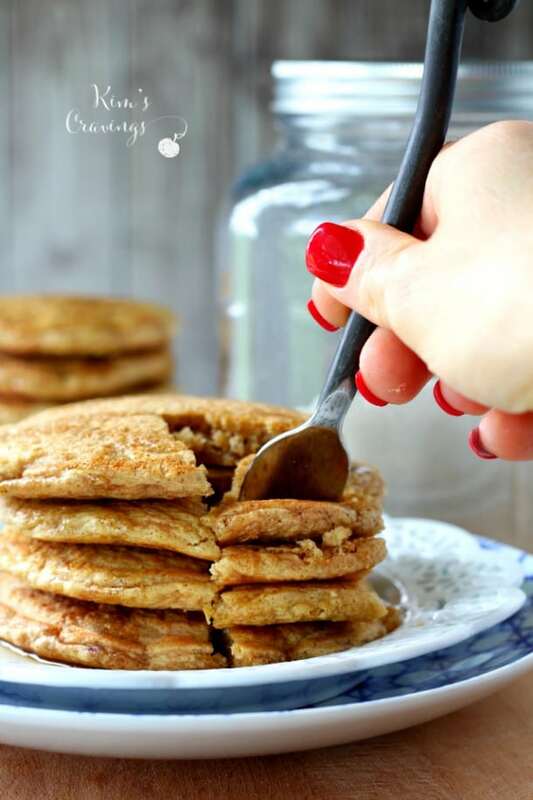 Don’t get bogged down with the ingredient measurements, the listed recipe is simply a guide. Salads are so versatile, feel free to add more or less of what you prefer and/or have on-hand. And incredibly tasty… definitely not your old boring salad! 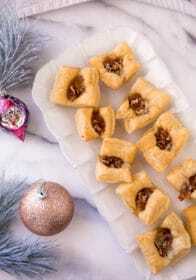 When you give this recipe a try, let me know! Leave a comment and tag a picture @kimscravings on Instagram. 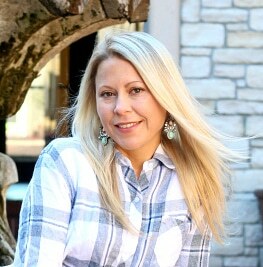 I would love to see what you come up with. Cheers, friends! 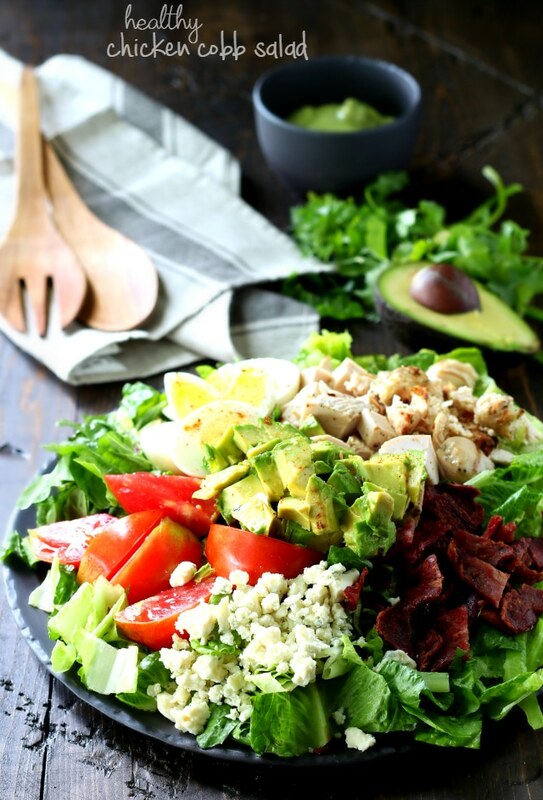 The classic cobb salad made healthier and way more flavorful! Cook bacon in a nonstick skillet over medium heat until crisp. Remove bacon from pan to cool and once cooled, dice. While bacon is cooking; prepare dressing by combining all 7 dressing ingredients in a food processor or blender; process until smooth. Arrange 2 cups romaine on each of 4 plates. 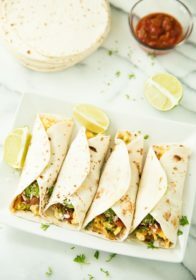 Divide bacon, eggs, chicken, avocado, tomatoes and cheese evenly among plates. Drizzle about 3 tablespoons dressing over each salad. 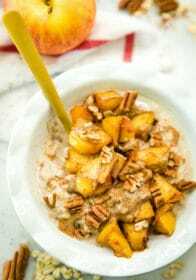 Alternatively, you can toss all ingredients in a large salad bowl and then evenly divide into 4 servings and drizzle about 3 tablespoons dressing over each salad. *Feel free to use a mixture of your favorite greens, such as 4 cups romaine with 4 cups baby spinach. My rule of thumb for serving salad is 2 heaping cups of chopped greens per person. 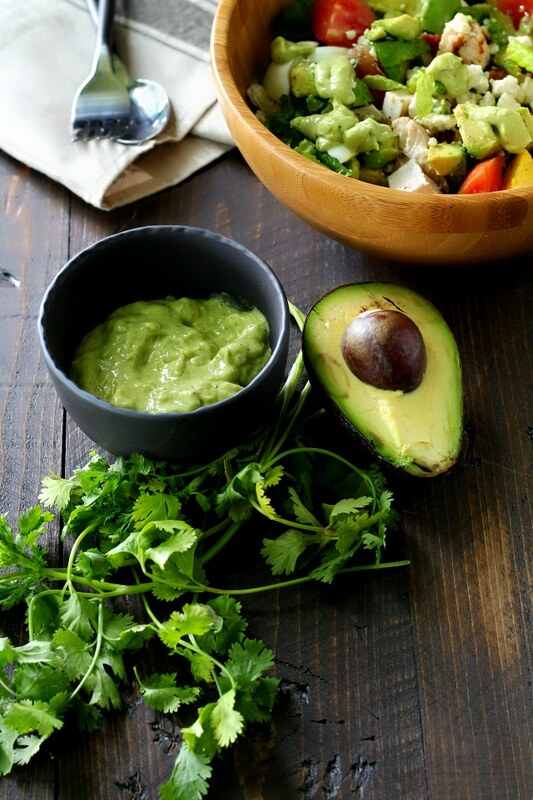 **Avocado dressing from Cooking Light. 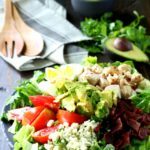 If you’re looking for other Cobb Salad varieties, you’ll enjoy these other recipes from some of my favorite bloggers. What’s your favorite salad recipe? 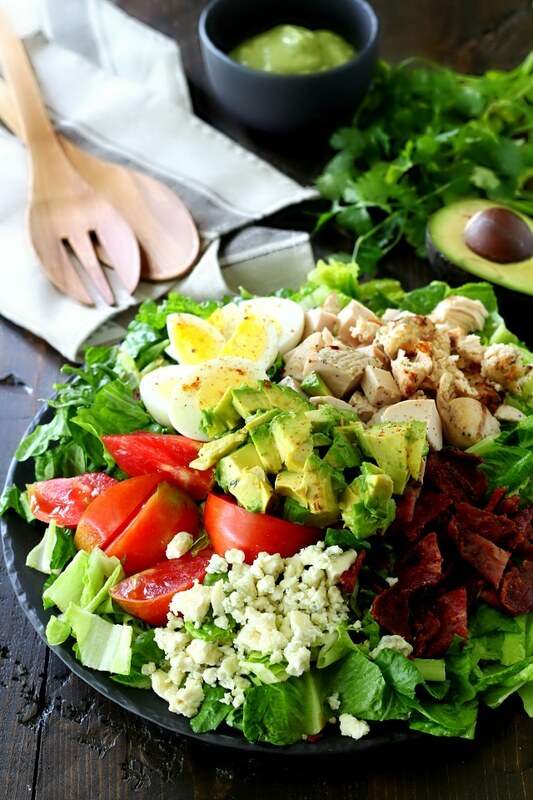 Have you ever tried making a cobb salad? 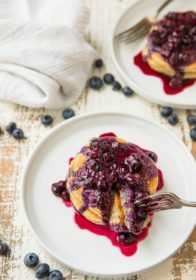 Join me for more recipes on Facebook, Instagram, Twitter and Pinterest! Kim’s Cravings is now on Snapchat! Want to see what’s going on behind the scenes around here? 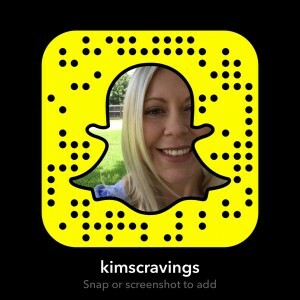 Add me on Snapchat – my username is kimscravings, or just snap a pic of my snapcode below. Send me a snap anytime – I’d love to hear from you! 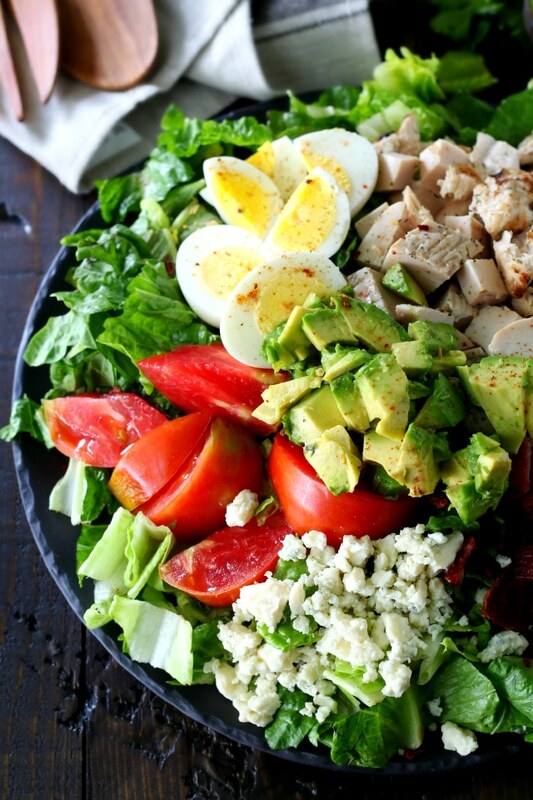 OH man, not much of a fan of blue cheese, but I do love a good cobb salad! 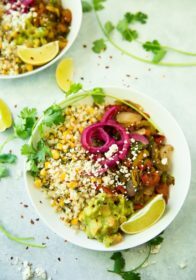 Often I don’t even use dressing because there are so many awesome flavors that mash together with these toppings! You’re right- there are so many flavors going on the dressing is really not even needed, but I will tell you it’s pretty delicious. I was even using it as a dip for raw veggies. Gah. I just love it when healthy stuff is tasty stuff. 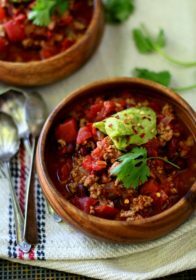 This looks so flavorful and filling and delicious. I’ve gotta try this one out ASAP!